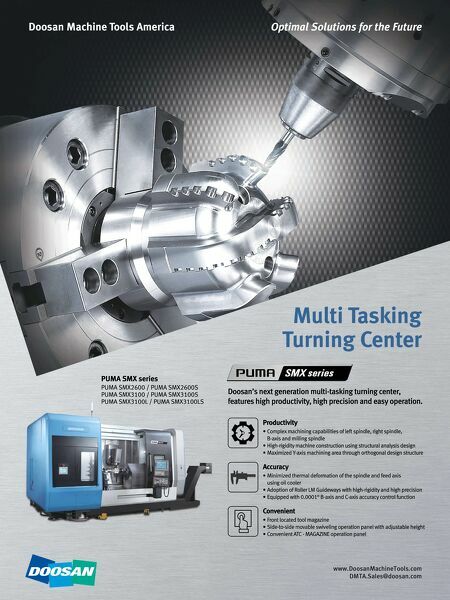 Production Machining - Your access to the precision machining industrial buyer. 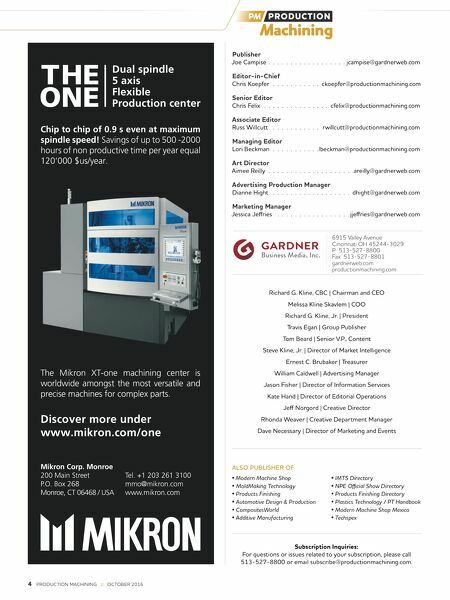 4 PRODUCTION MACHINING :: OCTOBER 2016 Publisher Joe Campise jcampise@gardnerweb com Editor-in-Chief Chris Koepfer ckoepfer@productionmachining com Senior Editor Chris Felix cfelix@productionmachining com Associate Editor Russ Willcutt rwillcutt@productionmachining com Managing Editor Lori Beckman lbeckman@productionmachining com Art Director Aimee Reilly areilly@gardnerweb com Advertising Production Manager Dianne Hight dhight@gardnerweb com Marketing Manager Jessica Jeffries jjeffries@gardnerweb com 6915 Valley Avenue Cincinnati OH 45244-3029 P 513-527-8800 Fax 513-527-8801 gardnerweb.com productionmachining.com Richard G Kline, CBC | Chairman and CEO Melissa Kline Skavlem | COO Richard G Kline, Jr | President Travis Egan | Group Publisher Tom Beard | Senior V P , Content Steve Kline, Jr | Director of Market Intelligence Ernest C Brubaker | Treasurer William Caldwell | Advertising Manager Jason Fisher | Director of Information Services Kate Hand | Director of Editorial Operations Jeff Norgord | Creative Director Rhonda Weaver | Creative Department Manager Dave Necessary | Director of Marketing and Events ALSO PUBLISHER OF • Modern Machine Shop • IMTS Directory • MoldMaking Technology • NPE Official Show Directory • Products Finishing • Products Finishing Directory • Automotive Design & Production • Plastics Technology / PT Handbook • CompositesWorld • Modern Machine Shop Mexico • Additive Manufacturing • Techspex Subscription Inquiries: For questions or issues related to your subscription, please call 513-527-8800 or email subscribe@productionmachining com The Mikron XT-one machining center is worldwide amongst the most versatile and precise machines for complex parts. Discover more under www.mikron.com/one Mikron Corp. Monroe 200 Main Street P.O. Box 268 Monroe, CT 06468 / USA Tel. +1 203 261 3100 mmo@mikron.com www.mikron.com Chip to chip of 0.9 s even at maximum spindle speed! Savings of up to 500 -2000 hours of non productive time per year equal 120'000 $us/year.